Baby announcement doesn't always have to be all cutesy. Just like Baby Z's. 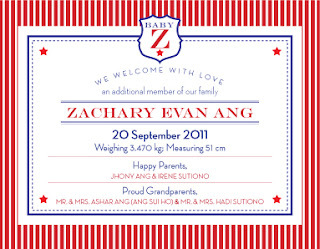 The theme for this baby announcement and labels is based on the American Flag, with bold red and blue. We kept the design clean and simple by using simple border, pattern and typography. Baby Z is in da house!